IN THE YEARS AFTER MUGS' DEATH, I climbed in the style he'd imprinted on me, venturing into places where nature was still in power, where everything became simple because no falling was allowed. A new partner, Alex Lowe, joined me on expeditions to Central Asia and Antarctica. In my memory, now, it's hard to fix a single image of him, for he was always moving, drinking coffee, bouncing on his toes. Like all his friends, I found myself caught up in that endless stream of energy, bewildered by what I could achieve while he cheered me on. Alex was more of a mathematician than a mystic: he looked for the speed record, the hardest lines, the empirical proof that what we'd just done was the greatest challenge we could set for ourselves. Mugs' parents had given me copies of his letters. In one note, Mugs had written, "Doing the extreme is not the point. I care less and less about that, but the desire to climb and be with nature's and the mountain's forces is still there, strong as ever." I didn't know where my own path lay. Instead of guiding or working odd jobs, I'd become a sponsored climber. Each year, the responsibilities of slideshows, articles, films—and eventually, digital media—seemed heavier. At times, it felt as if a wall of thorns had risen between me and that pure spiritual state that Mugs struggled so hard to attain. 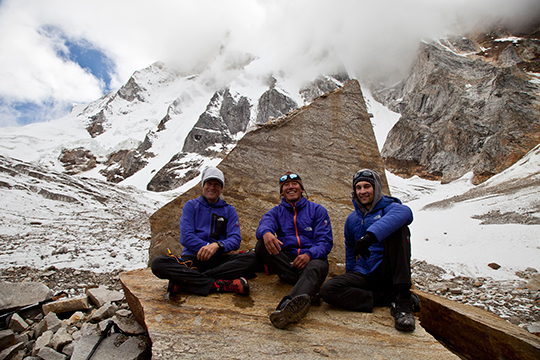 In 1999 an avalanche swept down the face of Shishapangma, engulfing me, Alex and David Bridges. I survived and they died. For the second time in seven years, I'd lost my best partner. Shortly before his death, Alex had written, "I have to question the complexity of our means of seeking happiness." I began to wonder: Is climbing an expression of our ego, a stab at immortality by saying "We were here first?" Or are we searching for that unknown and mysterious realm that can only be reached through toil and sacrifice, risk and adventure? Is it that metaphorical City of Gold that the early explorers sought in vain? In the wake of Alex's death, his widow Jenni and I fell in love. In 2001 I became her husband and a father to her three boys. I moved to a house in Bozeman filled with the sounds of children. Amid her bright-colored paintings, images of wild animals looked at you with almost-human eyes. There was a sadness to their playful dances and expressions, as if they were mourning their lost place in a changing world. I continued to climb, but with greater awareness. WITH EACH PASSING YEAR, the mystique of the Shark's Fin grew as expeditions from the UK, Japan, Italy, Slovenia, Korea and Russia tried and failed to climb Meru Central. In 1993 Paul Pritchard, Johnny Dawes, Noel Craine and Phillip Lloyd became friends with Om Gir ("Mountain of Power"), an ascetic who lived in a cave near the base, watching the foreign alpinists come and go. In Deep Play, Paul recalled how the risks heightened their senses to a mystical clarity: "load-carrying in the gully...trying not to wake the sleeping snow...the torchlight in our footsteps illuminating crystals...white electricity flashing over Shivling." 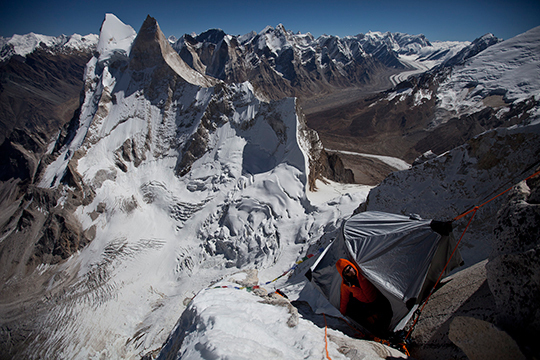 After seven days of climbing, they'd fixed lines to the headwall when Johnny dropped a boot. They retreated. "There was no place for anger over a dream which was misplaced in the night." In 1997, after Julian Cartwight's crampons broke, he and his partners continued to the ice below the headwall. Only when an anchor failed and Julian fell twelve meters did they give up. Nick Bullock felt as if they'd been climbing along the back of giant armor-plated worm that writhed beneath them in fear. Years later, he concluded: "Mountaineering on this scale is about searching out hidden places...[that] once found or reached are often a disappointment in the sense that they are never as enlightening as imagined. It is just another physical place, but the dream of that place and the journey to reach it generally is the hidden city we search." In the autumn of 2001, Valery Babanov returned for another try. Alone, with the aid of a fixed rope, he finished a line to the right of the Shark's Fin up the ice ridges that led to the north shoulder. The fluted runnels of the upper face seemed like a metro tunnel of ice above a thousand meters of night. "Around me was the first world—the real world," Valery recalled. "Then there was the second world over the crest—the invisible world, the world that existed only in my imagination.... What would I find up there? A mysterious entrance to another world?" (AAJ 2002). If he indeed found his "magic world" on the top, he could only linger for a brief moment. Clouds already rushed toward Meru, covering him with drifts of fog. 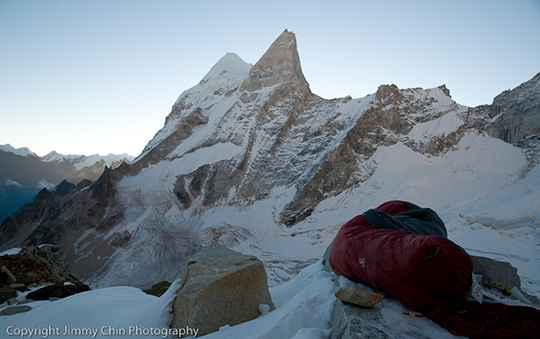 He named the route, "Shangri La," after the mythic Himalayan utopia. The summit had been reached, but not by the Fin, the one line of power that was Mugs' dream. The hidden wall was still unclimbed. IN 2003 DOUG CHABOT, Bruce Miller and I attempted the Shark's Fin in honor of Mugs. We planned a fast ascent with just packs, a tent and a light rack. We imagined moderate rock and secure alpine ice. The reality consisted of fractured stone and unconsolidated snow. From our highpoint on the flutings, I looked at the Fin every morning, bathed in golden dawn light. Gold is a soft metal, I thought. The orange granite appeared warm and welcoming, but I knew the line was a sharp blade—so steep for so long, with no place to bivy or even sit. As we bailed, another thought came: Use a different set of tools, a couple of haulbags and a portaledge. Between 1996 and 2006, Hiroyoshi Manome tried Meru several times with different small Japanese teams. In 2004 his partner Yasuhiro Hanatani fractured his ankle when a cam failed. During the retreat, he crawled across the Meru glacier. His friends nicknamed him "Doug Scott," after the British climber who broke his legs on the Ogre in 1977. Two years later, Manome returned with Hanatani, Makoto Kuroda and Yasushi Okada. Manome recalls: "I felt very strongly that I wanted to climb the Shark's Fin in pure alpine style...even if our chances of summiting were lowered.... In the modern capsule style of climbing big walls, I think there is no route unclimbable." After nearly a meter of snow fell, they gave up on the Shark's Fin and climbed a variation of Shangri La, carrying just three ropes and six ice screws. Shortly after the Japanese summited, a Czech team also bailed off the Shark's Fin and followed another variant of Valery's route to the top. These were the third and fourth recorded ascents of Meru Central. There had been more than twenty attempts on the Shark's Fin. It seemed as though it would always be one of those mythic, unfinished routes like the Fantasy Ridge of Everest or the North Ridge of Latok I.